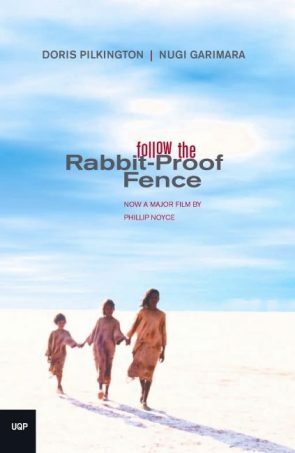 Follow the Rabbit-Proof Fence (1996) is the story of three young Aboriginal girls, sisters Molly and Daisy and their cousin Gracie, taken from their parents by government authorities in 1931, to live far from their home at the harsh Moore River Native Settlement. Written originally by Doris Pilkington Garimara, it was adapted as a film under the title Rabbit-Proof Fence, directed by Philip Noyce (2002). The children were part of what is now known as ‘The Stolen Generations’ and their story remains profoundly relevant to the lives of a great many Aboriginal children and families. While there has been significant critical response to the text both in itself and in the context of its adaptation, specifically in the realm of Australian cultural studies, it is pertinent and necessary to consider also the social context of the story. This is coming from the perspective of Aboriginal human rights and social justice. The era of Australian history that saw the children cruelly taken from their Aboriginal Mardu families and lands is not one that we are now proud of, although some people have sought to deny or minimise the extent of the past practices of Aboriginal child removal. In 1997, the national human rights body, the Human Rights and Equal Opportunity Commission (HREOC), tabled in federal parliament the report of its national inquiry ‘Bringing Them Home’, which found that the past widespread removal of Aboriginal children constituted a form of systemic race discrimination amounting to a ‘gross violation of human rights’ (‘Bringing Them Home’ 233). The HREOC inquiry involved consultations with Aboriginal people across Australia, including people who themselves had been taken from their families and placed into missions or homes with non-Aboriginal families. It involved a study of the laws, polices and practices that allowed for Aboriginal children to be removed from their families. Aboriginal child removal took place as part of a national policy to assimilate Aboriginal people and was based on the notion that Aboriginal people ‘for their own good’ should cease to exist as a race of people. The colonial governments did not value Aboriginal people or cultures and the removal of thousands of children from their families and land was a mechanism used to break down the Aboriginal culture and identity. These policies, whilst shocking by today’s standards, were then completely acceptable to non-Aboriginal Australians, including government officials and policy makers. They were underlined by then predominant ‘scientific’ theories of Darwinism, which promoted the European race of people as biologically superior to other races, denigrating Indigenous people as ‘inferior’ or ‘savages’ (Haebich 70). It was this ideology that also saw Aboriginal people dispossessed of their lands without a treaty and rendered marginalised by the dominant society. The practice of Aboriginal child removal was widespread and entrenched through laws such as the Native Welfare Act of 1905, which deemed the Native Protector, AO Neville, the legal guardian of ‘every Aboriginal and half caste child’ under 16 years of age. In Western Australia, Aboriginal children like Molly, Daisy and Gracie, were removed from their parents and placed in missions where they were denied the love and affection of their families, deprived of their Aboriginal culture, and forced to endure appalling living conditions. These removals were justified as being in the best interests of the children, although they clearly were not ((1)). In Follow the Rabbit-Proof Fence, the girls experience conditions at Moore River that are akin to incarceration: ‘It’s like a gaol. They lock you up and come and open the door in the morning.’ (66). They were shocked to learn they could not speak their Mardu language anymore, the dormitories were bare and overcrowded and the food inedible. The ‘inmates’ of Moore River could also be punished by way of solitary confinement for many days in a small concrete room with little light and ventilation. This was no place for anyone, let alone children: ‘It looked more like a concentration camp than a residential school for Aboriginal children.’ (Pilkington Garimara 72). Fortunately my Noongar family was not torn apart by the past practices in the way that so many families had. My Kurin Noongar great-grandmother (Ethel Woyung) and wadgella Irish-Australian great-grandfather (James McGlade) lived and worked in the bush avoiding attention of the Native Welfare department. Their marriage was prohibited (as were all intermarriages) but this did not worry them too much as they loved each other and their children. My mother grew up in the bush with her father and grandparents and also managed to escape detection by the authorities. Many of my relatives, however, were not so fortunate and they suffered the pain of having their families torn apart under these policies. I remember one aunty telling me how they cried out in the night for help but none was forthcoming. She was speaking of the abuse of children that took place in these missions. My Noongar family also has our own connection to the infamously harsh Moore River Native settlement. Moses Woibung, my great-grandfather and Noongar elder from the Kurin people had as an elderly man been transferred from the Carrolup mission to Moore River settlement where he likely passed away. I imagine that great-grandfather Moses also experienced the hardship of life at the mission, where Aboriginal people were treated so cruelly. While the history of Aboriginal child removal as experienced by the young protagonists Molly, Daisy and Gracie was finally recognised in 1997 through the HREOC national inquiry, the extent of what had happened in the past was not accepted by the government of the day. The then Prime Minister John Howard disagreed with the report findings that Aboriginal children had been wrongly removed for reasons of race alone, or that one generation could apologise for the past. He did not accept the recommendation that all Australian parliaments acknowledge responsibility for the practices of past child removal and negotiate an official apology with Aboriginal people and other appropriate reparations or remedies for the past wrongdoing (‘Bringing Them Home’ 250). It was a turning point in Australian history when a subsequent federal government agreed there should be a national apology for what had happened. Many Aboriginal people present in the Great Hall of parliament, myself included, wept and cried openly in hearing these words. There had been too much pain and the true story of our history had been suppressed for too long. The apology was so powerful that many Aboriginal people believed that healing and reconciliation was truly now possible, even within our reach. Sadly, nearly a decade later, it seems that the apology has not been able to bring real change into the lives of Aboriginal children and families. While the Native Welfare department no longer exists, having been superseded by the Child Welfare Protection Department, the Chief Executive Officer of this body today is now the legal guardian through the state of thousands of Aboriginal children who have been removed from their families. Increasingly, the Aboriginal children removed are placed with non-Aboriginal families far outside their traditional home and country (2). According to the Australian Institute of Health and Welfare (AIHW) at 30 June 2016, the rate of Aboriginal and Torres Strait Islander children on care and protection orders was almost ten times that for non-Indigenous children. Legislation for child removal is state-based, there is no federal authority as such. In every state and territory, the rate of Indigenous children on orders was higher than the rate for non-Indigenous children. The highest recorded rate of overrepresentation was 16.8 in Western Australia. (AIHW 43) While the rates of non-Aboriginal children being taken into care has declined, the removal of Aboriginal children has increased, and in 2016 there were in Western Australia 2,617 Aboriginal children in care (as compared to 2,326 non-Aboriginal children in care). (AIHW 43) The AIHW data indicates that, as of 30 June 2016, one Aboriginal child in every seventeen had been removed from families. Child removal is no less distressing today than it was in the past. Two years ago, here in Western Australia, I witnessed inadvertently the immediate aftermath of Aboriginal child removal and the pain of a young child in great distress. No Aboriginal people were even present to comfort him as he tried to make his way free and back to his family. It was cruel and unfathomable that our children could still be treated in this way. Very often Aboriginal children in out-of-home care are moved from home to home, with multiple foster care placements a common experience. This in turn is known to increase the likelihood of poor outcomes in life and in relation to education, employment, social, behavioral and emotional problems. (See: Australian Institute of Family Studies, ‘Children in Care’) Sometimes the foster carer cannot cope with the children’s traumatised and difficult behavior, and little support is typically offered to Aboriginal carers (Thomson, McArthur, Watt 33–38). The children may not always be treated well and valued in their foster homes and some foster carers’ motivations may not be in the children’s best interests. (‘Speaking Out About Raising Concerns in Care’ 26–31) Unfortunately, children placed in out-of-home care can also experience abuse in their new homes. Many children have reported abuse, including sexual abuse, and not feeling safe in their care home. (Robertson np) They may not know their Aboriginal family, or have any understanding of why they were removed. Aboriginal children frequently experience dual forms of racism or discrimination as Aboriginal children and as a ‘government kid’. There are many interlocking factors causing the removal today of too many Aboriginal children. Family violence is a main cause of contemporary Aboriginal child removal. The violence of colonisation, directed at Aboriginal people and including sexual violence against Aboriginal women and girls, even those as young as Molly, Gracie and Daisy, has turned inwards amongst Aboriginal communities as women and girls suffer exceedingly high rates of interpersonal violence. Aboriginal people also experience disproportionate rates of poverty and many Aboriginal children are removed following an assessment of ‘neglect’ that is often closely linked to poverty. In addition, Aboriginal child rearing practices have not been recognised by non-Aboriginal people and authorities and have been misinterpreted as neglectful of children. As Follow the Rabbit-Proof Fence also shows us, Aboriginal children and families have always been under surveillance. ‘No matter where the three girls went, there was always someone watching them very closely’ (Pilkington 41). The continued surveillance of Aboriginal children and families today plays a role in high levels of contemporary child removal. In considering child removal, we must look at the outcomes for children removed. Astoundingly there is little evidence that removal is improving the lives of the children removed. To the contrary, children in out-of-home care generally have poor outcomes. They are more likely to experience poorer health, depression, violence and suicide over their lives, be imprisoned, abuse drugs and alcohol, less likely to have healthy relationships and less likely to have access to education and economic opportunities. (‘The Family Matters Roadmap’ 3) Removal of Aboriginal children from their families should only be a matter of last resort, and if they are not given a better life in care, then they should be returned to their families who often grieve for them long after their removal. Rudd was echoing the concern held by many Aboriginal people that while the past discriminatory practices of child removal have been denounced, our shameful history is ongoing and current child removal practices are reflective of and embedded in our past. The Special Rapporteur said that there should be greater engagement with the Aboriginal and Torres Strait Islander family and community in decision-making and increased support for community-led early intervention programs investing in families to prevent child removal. The Australian government should appoint Aboriginal Children’s Commissioners in each State and Territory and develop a national strategy in order to eliminate the over-representation of Aboriginal and Torres Strait Islander children in out-of-home care. The findings of the Special Rapporteur represent a significant response of the UN to very serious issues of human rights confronting Aboriginal children and families and Australia as a nation. The Australian governments, both state and federal, should respond to the issues highlighted in the report, by implementing the important recommendations. As the Special Rapporteur noted, Australia has made a bid for a seat on the Human Rights Council and it is critical Australia also evidences a commitment to human rights at home. In 2012, I took part in the National Child Rights Taskforce that travelled to Geneva to address the UN Committee on the Rights of the Child who were then considering Australian government’s report on the implementation of the Convention on the Rights of the Child. After hearing considerable evidence put before it, the Committee expressed concern that racial discrimination against Aboriginal children remains a problem. They noted that there was ‘serious and widespread discrimination faced by Aboriginal and Torres Strait Islander children’ (‘Committee on the Rights of the Child’ 7) in relation to the provision of and access to basic services and significant over-representation in the justice system and out of home care. The Committee was also concerned about the large numbers of Aboriginal children being separated from their homes and communities and placed into care that does not adequately facilitate their cultural and linguistic identity. The UN Committee on the Rights of the Child found that there was inadequate consultation and participation of Aboriginal people in policy design, decision-making and program implementation. It recommended to the Australian government that it review its progress and implementation of the recommendations of the ‘Bringing Them Home’ Inquiry, to ensure the full respect for the rights of Aboriginal children to their identity, name, culture and family relationship. It also recommended that Aboriginal Children Commissioners be appointed at the state and federal level to ensure advocacy and increased respect for Aboriginal children’s human rights within government agencies. Unfortunately, there has been little progress made towards the implementation of the 2012 report recommendations. No review of the ‘Bringing Them Home’ recommendations has commenced. Aboriginal participation in out-of-home care responses remains inadequate. Governments are also implementing a policy of permanent child removal in the face of widespread Aboriginal opposition. Indigenous peoples have the right of self-determination. By virtue of that right they freely determine their political status and freely pursue their economic, social and cultural development. While Aboriginal peoples right to self-determination has been included in various state legislations governing child welfare and protection, it has usually not been afforded any real recognition in practice. The gesture of recognition has become tokenistic and will remain so without reforms that allow and support for the right to be implemented in the practices of child protection. In some jurisdictions, notably Victoria, there are reforms underway that promote Aboriginal peoples’ participation in decisions and process concerning children. This includes Aboriginal family-led decision-making processes that are guided by Aboriginal cultural tradition and supporting families and community to engage in the process and make decisions about the wellbeing of their children. According to the SNAICC, the situation of Aboriginal child removals today is unlikely to change without a radical rethink and overhaul of child protection concerning Aboriginal children. SNAICC has established a national campaign ‘Family Matters’ to reduce the over-representation of Aboriginal children in care. It has issued a ‘Roadmap for Reform’ presenting evidence based vision and strategy for change to policies and practices. The ‘Family Matters’ campaign is grounded in strengths-based Aboriginal-led solutions. It encompasses an early intervention and preventative focus, supports trauma-informed healing and cultural safety in policies and practices. Child removal should only be a matter of last resort, there should be supports to ensure the safe return of children to families and the right of children to family and culture should be safeguarded. We learn from Follow the Rabbit-Proof Fence that the removal of Aboriginal children did not end with Molly, Gracie and Daisy. Just as Molly’s own daughter Annabelle was removed from her and sent to the Sister Kate’s Children’s Home in Perth, the practice of removing of Aboriginal children from their families has never stopped. It has continued and been experienced by successive generations of Aboriginal people. The suffering that always accompanies Aboriginal child removal has continued and the painful consequences of our past have not ended. Follow the Rabbit-Proof Fence powerfully reminds us that there are stories that we must always tell of our history, of Aboriginal dispossession and racial oppression, of the strength and resistance of Aboriginal children and families. Perhaps even more importantly, this is a story of hope, commitment and resolve. As Molly once told her younger sisters, ‘I know it’s a long way to go but it’s easy. We’ll find the rabbit-proof fence and follow that all the way back home.’ (Pilkington Garimara 78) Follow the Rabbit-Proof Fence offers us the opportunity to understand what happened in the past, why it is relevant today and what we must do to address the painful and wrongful legacy of Aboriginal child removal. This inspirational true story signals our past and our future, of another journey we have to make, one that we must make together. (1) Christine Choo’s chapter ‘The health of Aboriginal children in Western Australia 1829-1960’, in Aboriginal Children, History and Health (ed. John Boulton, 2016), talks about the deaths of children at Moore River settlement between 1916 and 1962, based on the burial registry for the settlement (102-116). The largest number of those buried at the settlement were children under five. They died from a multitude of serious health conditions and diseases (113), largely preventable and related to the environment in which they lived. (2) Chris Serra’s article in The Guardian ‘Too many Indigenous children are taken from their families—it doesn’t have to happen’ (23/5/17) demonstrates the growing public awareness and concern over this situation. Australian Institute of Family Studies. 2016. ‘Children in Care’, CFCA Resource Sheet, October 2016. Canberra: Australian Institute of Family Studies. Sourced at: https://aifs.gov.au/cfca/publications/children-care. Australian Institute of Health and Welfare. 2017. Child Protection Australia 2015-16. Canberra: Australian Institute of Health and Welfare. Choo, Christine. 2016. ‘The health of Aboriginal children in Western Australia 1829-1960’, in Aboriginal Children, History and Health, ed. John Boulton. London: Routledge, 2016: 102-116. Haebich, Anna. 2000. Broken Circles: Fragmenting Indigenous Families, 1800-2000. Fremantle: Fremantle Arts Centre Press. Pilkington Garimara, Doris. 1996. Follow the Rabbit-Proof Fence. St. Lucia, QLD. : University of Queensland Press. Dr Hannah McGlade is the Senior Indigenous Research Fellow at Curtin University, School of Humanities. She was the recipient of the 2011 Stanner award for her book Our Greatest Challenge: Aboriginal children and human rights. A human rights lawyer, Dr McGlade has advocated for Aboriginal women and children’s human rights nationally and internationally. In 2016, she was appointed the Senior Indigenous Fellow at the UN office of the High Commission for Human Right.